She will be lighting up the sky in the Rival Alice Girls One Piece! This neon-inspired look is midnight black with glowing neon pink hearts, prickly emerald cacti, cute rose and green cherries, and snowy white clouds! With aquamarine strap accents and a golden Rival logo at the front and centre, this look has it all! Of course, like everything that this awesome Aussie company makes, the Rival Alice Girls One Piece is built to last! 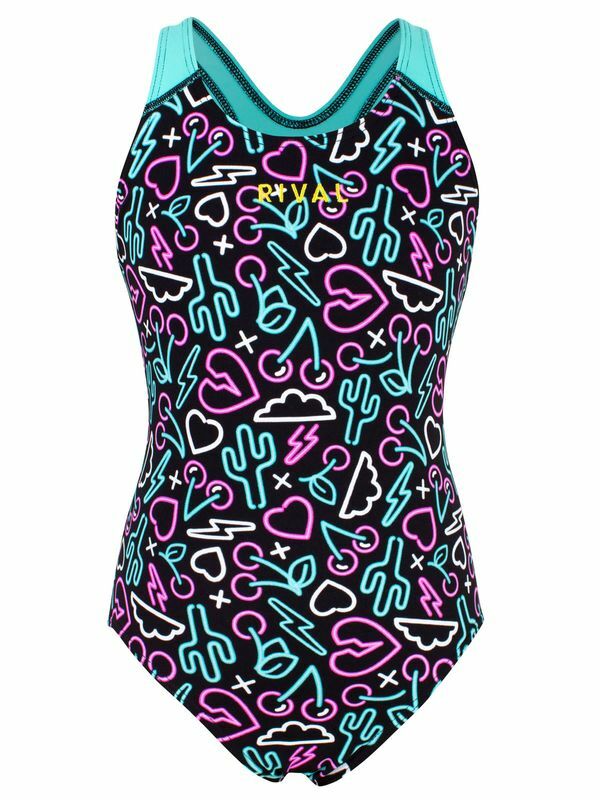 Made with Rival Resist chlorine resistant fabric, this one piece offers high UV protection and unique three-way stretch technology that fits and moves like an electric dream!